Asthma is a common condition, which affects 10 to 20% of children and 5% of adults. Asthma usually occurs in childhood, and more than half of those affected will outgrow their asthma by the teens, it can however occur at almost any age. There is usually an atopic or allergic tendency with asthma to occur in allergy prone families. This presents with other atopic conditions such as infantile eczema, allergic rhinitis, conjunctivitis and hay fever. Asthma beginning in adulthood usually doesn’t have an allergic basis, but may be an associated salicylate or aspirin sensitivity. Unfortunately asthma cannot be cured but can be well controlled so that those affected can live normal lives and enjoy sport and other recreational activities. Most asthma patients will be allergic to certain indoor and outdoor allergens such as cats and dog skin scales, house dust mites, tree and grass pollens and fungal mould spores. The symptoms so typical of asthma are tight chest and wheezing, a dry hacking cough and shortness of breath especially with exercise. This is due to a narrowing of the small airways in the lungs. This narrowing is brought on by tightness of the airway muscles with inflammation and swelling of the airway membranes plus overproduction of thick sticky mucous within the airway tubes. Airway inflammation is triggered by an allergy or when something irritates the airways. Day to day variation in Peak Expiratory Air-flow of 15% or more confirms the likelihood of asthma. This so-called “diurnal variation” is measured with Peak Expiratory Flow (PEF) Variability. Lower PEF measurements are usually seen in the early morning and highest PEF measurements in the evening. Asthmatic symptoms that occur occasionally (less than twice a week) and which respond promptly to reliever treatment are classed as mild orintermittent asthma. When asthma becomes more persistent and symptoms occur more often than twice per week, with night-time flare-ups; this is then called Persistent asthma. Depending on severity asthma would be classed as mild persistent, moderate persistent or severe persistent (where symptoms occur every day and are difficult to control with standard preventer or reliever medications). Asthma exacerbations are usualy triggered by allergies to house dust mites, furry animals, birds, grass and tree pollens, indoor moulds and some foods and preservatives. A viral cold or even flu can bring on an asthma attack and this exacerbation may persist from four to six weeks unless treatment is increased. Air pollution in the home such as cigarette smoke, certain chemicals and even motor car exhaust fumes can trigger asthma. Stress and emotional issues – upset, anxiety and laughing can all trigger an asthma attack. There is no evidence that “nerves” alone can be the cause of asthma. Processed food and soft drinks containing Sulphur Dioxide and Sodium Benzoate can trigger of asthma in susceptible people. Asthma can’t be cured but with correct treatment most asthma sufferers will have completely normal lives. 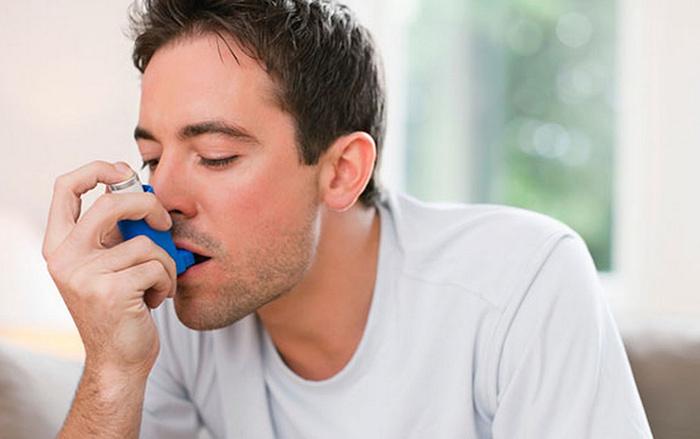 Basic asthma treatment consists of: PREVENTER and RELIEVER inhalers. These are usually given in an atomised dry form via inhaler devices. The use of plastic SPACER devices is recommended to increase the amount of the medication reaching the lungs. Allergy testing is important to identify which indoor and outdoor allergens are triggering the asthma. We perform Skin Prick Tests or ImmunoCAP RAST tests on a blood sample, testing for IgE antibodies to house dust mites, tree and grass pollens, cats and dog dander’s, mould spores and cockroach allergens. When the specific allergen is confirmed, avoidance of that trigger allergen may help control symptoms. These guard against asthma attacks by stopping inflammation and swelling of the lung membrane lining in the airways. They will not give instant relief and take 2 weeks to build up their effect, and therefore they must be used regularly every day. Preventer medicines include low dose inhaled cortico-steroids such as Beclomethasone (Becotide, Beclate, Qvar, Clenil), Fluticasone (Flixotide), Budesonide (Budeflam, Pulmicort) and Ciclesonide (Ciclovent, Alvesco). These inhalers are very safe to use at the recommended dosages and MUST BE USED CONTINUOUSLY EVEN DURING SYMPTOM FREE PERIODS. Oral preventer asthma medications called Leukotriene Receptor Antagonists are available such as Montelukast (Singulair, Mont Air, Kulair). Monoclonal anti-IgE antibodies in the form of Omalizumab (Xolair) although expensive have enormously improved control of severe allergic asthma, this treatment may not be readily available. These drugs will help patients with acute asthma during an actual asthma attack. They relax the smooth muscles surrounding the bronchial airways and give instant relief of wheeze and tight chest. If they need to be used more frequently than twice a week, this is an indication of poorly controlled asthma and the Preventer dosage should be increased. If the dosage requirement increases to more than the doctor has prescribed, then contact your doctor to discuss this. Reliever inhalers include Salbutamol (Ventolin, Venteze, Asthavent), Terbutaline (Bricanyl), Fenoterol (Berotec) and Ipratropium (Combivent & Duovent). Longer acting asthma relievers are called Controllers are beneficial and Salmeterol (Serevent) or Formoterol (Foradil, Oxis) are effective examples which are prescribed twice daily. As more effective treatments have evolved, older oral tablets such as the Theophyllines and Aminophylline are prescribed less often these days due to their high adverse side effect profile and drug interaction. Combination Preventer and Reliever medications are now very popular as they integrate both reliever and preventer in one inhaler. Examples include Seretide, Foxair, Vannair and Symbicord. Seretide and Foxair are a combination of Salmeterol and Fluticasone and this mixture has a synergistic or additive effect on asthma control and treatment. Symbicord and Vannair are other popular combination preventer and controller inhalers which contain Budesonide and Formoterol. Both reliever and preventer medicines are essential and have revolutionised asthma control over the last 20 years. This has resulted in fewer asthma hospital admissions and greater quality of life. Complementary and alternative asthma treatments are less effective than conventional mediaction. Homeopathy, Buteyko, acupuncture, physiotherapy, salt pipes and breathing exercises are not as good as conventional inhaler treatment. If you consult a practitioner other than your doctor, continue taking your preventer and reliever medicines at the same time. It is very important to recognise when asthma is getting out of control. Asthma usually starts to get worse at night or in the early hour of the morning and this indicates a need for additional treatment. If wheezing or a tight chest is not relieved by several reliever inhalations and if there is difficulty with speaking whole sentences, this requires urgent medical assessment and treatment. Those asthmatic sufferers that are frequently troubled with asthma exacerbations should have their own PEAK FLOW METER at home to measure their lung performance and know when extra treatment or medical advice is needed. Always have an emergency Asthma Management Plan from your doctor – you may need to keep a short course of oral Steroid tablets (Prednisone, Meticorten) at home to take in case of asthma emergency. Your GP, Paediatrician or Pulmonologist may develop a STEPWISE ASTHMA MANAGEMENT PLAN with you. This should explain exactly how to use your preventer and reliever medications and when to increase your medication if the asthma gets worse. Classic asthma: With reversible wheeze and airways spasm, there are usually eosinophil cells in the phlegmand this responds well to reliever muscle relaxants (salbutamol) and inhaled steroids (beclomethasone). Cough-variant asthma: Is a dry hacking cough which responds well to relievers alone and is associated with a very sensitive airway cough-reflex. This is a common presentation inlittle children with small airways and only a third will progress to develop actual asthma. Eosinophilic bronchitis: A chronic cough occurring in adultsand also associated with eosinophils in phlegm, but no airways spasm or wheezing. This condition may eventually progress to irreversible airway disease as occurs in chronic obstructive bronchitis (COPD) and emphysema. This cough does not settle with reliever inhalers but does improve with inhaled steroid inhalers. Atopic cough: Is an isolated chronic troublesome cough in children is not associated with airways spasm or wheezing. There will usually be a family history of atopy, and allergy skin tests are positive with raised antibodies (IgE). But there are usually no eosinophils in the phlegm This atopic cough responds better to antihistamines (diphenhydramine, levocetirizine, desloratidine or chlorphenamine) and inhaled steroids but not at all toreliever bronchodilators (salbutamol).